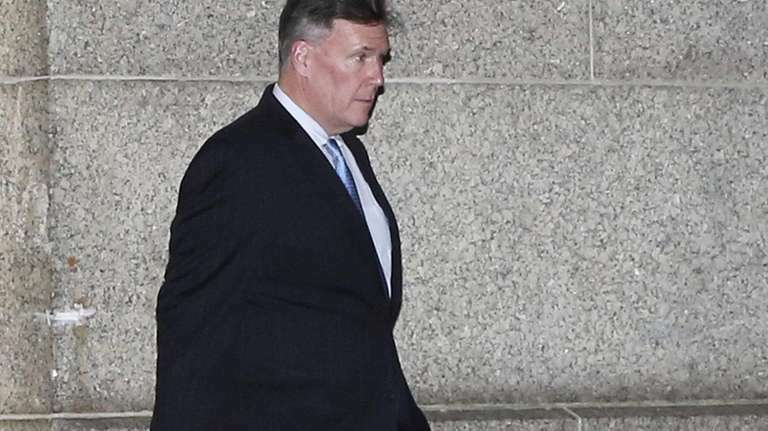 Howe, who was jailed during testimony at Joe Percoco's bribery trial, is to be sentenced April 5. Manhattan federal prosecutors are still vouching for star corruption cooperator Todd Howe, urging the judge who will sentence him to credit his help even though he violated his deal with the government and had to be jailed during testimony at former top Cuomo administration aide Joe Percoco's bribery trial. Ex-lobbyist Howe, a former assistant to Gov. Andrew M. Cuomo, admitted to a lifetime of frauds on the witness stand, violated his plea deal by using $80,000 set aside for taxes to pay personal expenses, and was jailed for 6 months after admitting at Percoco’s trial last year that he had disputed credit card bills that were valid while cooperating. But in a letter filed late Friday, prosecutors nonetheless told U.S. District Judge Valerie Caproni that Howe was "truthful and … reliable" and had provided “significant” assistance convicting Percoco of bribery schemes involving a developer and a power company, and exposing a separate bid-rigging fraud in the “Buffalo Billions” development project. “Howe was … a productive and helpful cooperating witness in an important public corruption case that sent a powerful deterrent message,” the government wrote. Caproni is scheduled to sentence Howe on April 5 for crimes including the Percoco bribery schemes and the bid-rigging conspiracy involving former SUNY official Alain Kaloyeros — all of which he set up for lobbying clients — as well as embezzling $1.7 million from the law firm where he worked. The government filing made no specific sentence recommendation, but its letter came hours before Howe's attorney said in his letter to the judge that the help lauded by prosecutors merited a sentence of “time served” — the 6 months Howe's already done, instead of the 262 to 327 months called for under advisory federal guidelines. Lawyer Richard Morvillo said Howe was a changed man, and court probation officials have recommended the same time-served sentence. “Simply put — and even in the harsh light of his errors — Todd’s level of cooperation is above and beyond that of many defendants,” he wrote. The prosecution letter calling for the judge to credit cooperation — called a “5k.1” letter — is the lure prosecutors use to get criminals to cooperate against others. But cooperators must agree to not commit any further crimes, and Howe’s behavior and jailing had raised questions about whether he might lose the government’s support. Prosecutors did discuss what they called the “detriment to the government’s case” caused by Howe’s misbehavior. At the start, they said, he was allowed to keep $80,000 from the sale of his house to help pay $714,000 tax liability incurred from his embezzlement of $1.7 million from the law firm Whiteman Osterman & Hanna. Instead, he spent almost all of it on personal expenses. At Percoco’s trial, after he admitted a previous conviction for check fraud and a lifetime pattern of trying to cheat creditors from car rental companies to home repair providers, a defense lawyer forced him to admit during cross-examination that after beginning to cooperate he had also tried to dodge a credit card bill for a stay at the Waldorf Astoria while he was working with prosecutors. He was jailed after that admission, and prosecutors decided to try the Kaloyeros bid-rig case without him because of credibility issues. Caproni gave Howe bail last August to go to Idaho and work as a golf course groundskeeper. In its letter, the government said Howe insisted he made a mistake about the Waldorf bill and didn’t intentionally try to cheat. Prosecutors said it was “reckless” and negatively affected their cases, but said “it remains the case” that he otherwise worked hard and honestly to bring the schemes to light. “The significance and usefulness of his cooperation should be measured in proportion to the significance and impact of the prosecution which he furthered,” they wrote. A lawyer for Percoco declined to comment on the government's letter. Caproni is not bound by prosecutors' recommendation.